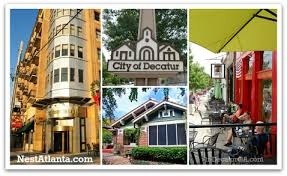 The city of Decatur is four square miles of hometown hipness with 18,000 residents inside Atlanta’s I-285 perimeter highway. Ponce de Leon Avenue is our main street, connecting us to the city of Atlanta, just six miles to the west, and to historic Stone Mountain, just six miles to the east. A quintessential college town, we have Agnes Scott College, Columbia Theological Seminary within our city limits. Branches of the Art Institute of Atlanta and DeVry University bring hundreds of commuting students, faculty and staff to our downtown square. Emory University is close by with a free shuttle carrying students and residents between campus and downtown Decatur. And with more than 200 mostly independent shops, restaurants, galleries, salons and other service businesses, Decatur draws students, office workers, residents and visitors who love to "shop local" in our walkable tree-shaded downtown. Last updated on Apr 21, 2019 10:10:pm.